CBR Woodworking recently met a variety of challenges to build a massive two-sided bar shaped like a football for an NFL lineman. The bar, which was built for an NFL player, was designed with a sports feel. Some of the design inspiration was taken from desks at sports broadcasting studios. Building a bar strong enough to fit the needs of a professional football player is no small task. Especially when the bar has two 14-foot sides that are curved and tapered to resemble a giant football. CBR Woodworking recently tackled such a job at an NFL linemanâs home. From design to fabrication to installation, the year-long project took more than 1,000 man-hours. The result was worth the work and the wait, says Robert Schultz, owner of the Hainsport, NJ-based company. âWeâve done projects as unique as this, but definitely nothing like it,â Schultz says. The bar, which now sits in the player's house, features two 14-foot curved sides, a rainforest green marble bar top and stainless steel cabinetry. The piece also has a center-island shaped like a football with a solid mahogany countertop and a maple inlay made to look like football laces. âWe wanted to give it a sports feel and build a really cool bar with a high-tech look,â says Schultz, who did the design concept for the project. He adds that some of the inspiration for the bar came from desks at sports broadcasting studios. The job began when CBR was one of three companies to submit a proposal for the project, and the initial design concept for the bar was done by the architectural firm David Donachy Architect. âIt was really a credit to (the player) that he let us take the project and run with it,â Schultz says. The project landed CBR additional business. 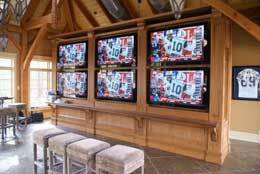 They built this quartersawn oak wall that holds six televisions within view of the bar. The engineering process then began, and there were a variety of challenges for head engineer Tom Lott and his team, which used Microvellum software during the engineering and design phase. One of the biggest issues was factoring room in the barâs walls for piping and wiring to feed appliances such as icemakers, refrigerators and dishwashers. Since CBR was building the bar in the center of the room, everything had to be fed through the floor and into the bar, and placement had to be coordinated with other contractors, such as electricians and plumbers. Another part of the project that required extensive engineering was the overall shape of the piece. Schultz adds that the tapered shape of the bar, combined with its potential patrons, forced the company to innovate when it came to bracketing and structural support. The bar features two tapered and curved 14-foot sides with an island in the middle that has a countertop modeled after a football. Since the bar was tapered, CBR also had to come up with a âcleverâ bracketing system to install the piece into the basement floor, he adds. The bar also led to more business for the company from the football star, he adds. CBR was commissioned to build a quartersawn oak wall in front of the bar to display six 60-inch flat-panel televisions. Schultz adds that about 25 percent of the shopâs jobs are design-and-build projects like the football-shaped bar. The other 75 percent are built based on a design provided by an architect.